I really love homemade gifts. There’s just something so special about something handmade. But just because it’s a DIY doesn’t mean it has to take all day long! You can easily throw together a last-minute birthday gift that’s meaningful and totally unique. If you ask me, that’s a win-win. And there are so many different kinds of DIY gifts that you can make for girlfriends, guy friends, and really any kind of friend. 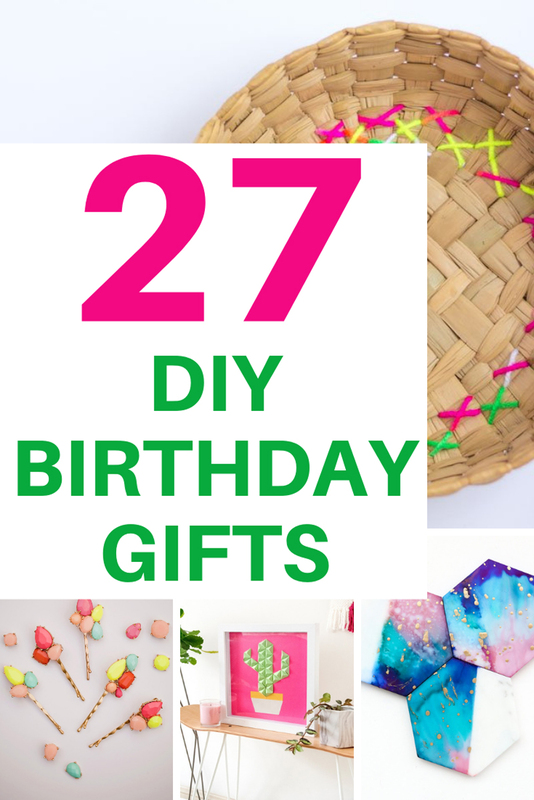 So, in the spirit of homemade fun for everyone, I’ve made a list of 27 DIY Birthday Gifts that you can make in under an hour, for everybody on your list. These gifts are perfectly girly, sentimental, and sweet for those gals in your life who are just so deserving of something handmade and straight from the heart. Gemstone Bobby Pins: Break up an old necklace you aren’t wearing anymore and turn it into something pretty and new! 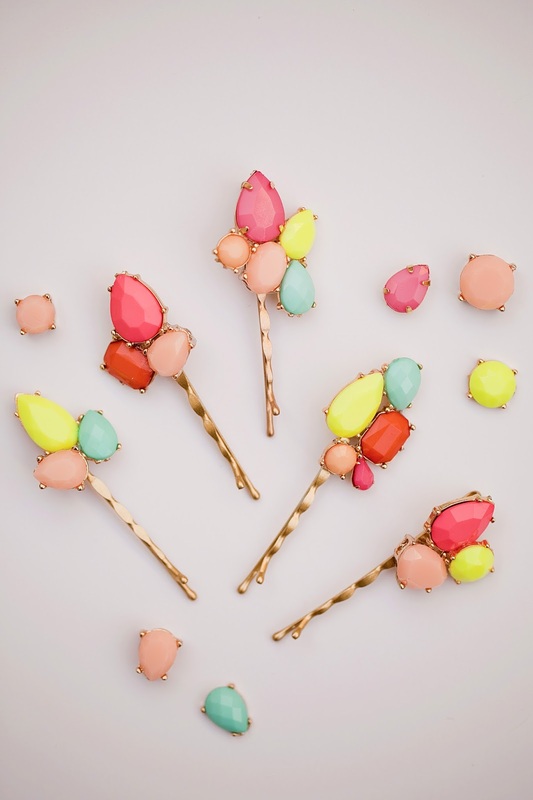 These bobby pins will brighten up any OOTD. Painted Pineapple Shoes: Start with a pair of plain white sneakers, add some painted pineapples, and you’ve just created the sweetest pair of kicks for spring, summer, and beyond. As long as we are talking accessories, these DIY tassel earrings & DIY tassel necklace are pretty choices for crafting DIY birthday gifts your ladies will adore. 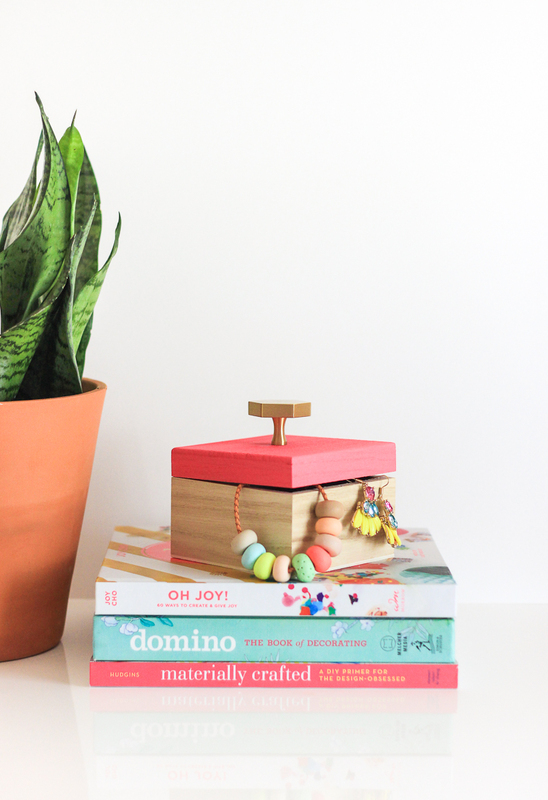 Jewelry Box: So, I’m a little bit partial to this jewelry box DIY because it sits atop my book, Materially Crafted. But even outside of that, it’s super cute, takes mere minutes to make, and is the perfect gift for any gal. Geode Ring: Love the uniqueness of geodes, each one having a slightly different shape and shade. Stick one atop a ring and you’ve got a present that’s fit for a queen! Guys like DIY presents too. And especially when they’re from the loveliest ladies in their lives! Bow Tie: Dapper up your best guy with this make-your-own bowtie. Best part, you get to hand pick the fabric so it’ll go perfectly with his personality. 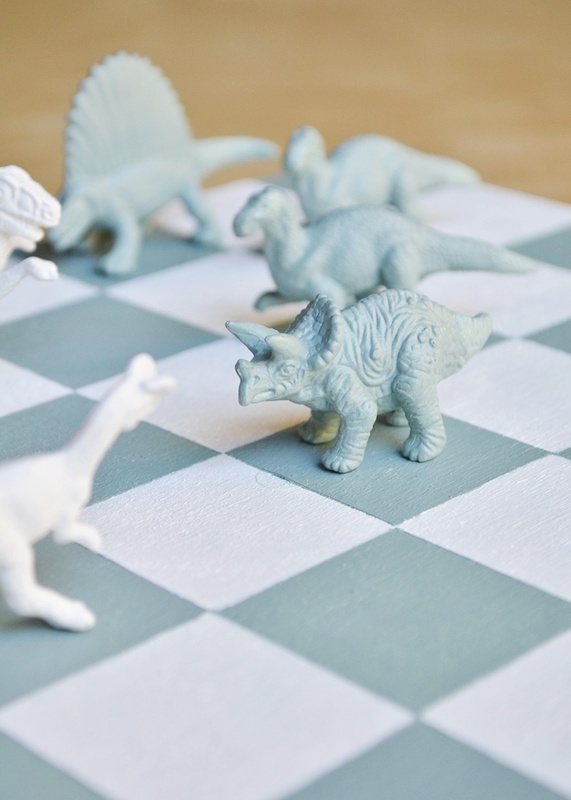 DIY Dinosaur Chess Set: Up his chess game with this super fun set that features dinosaur figures in place of traditional chess pieces. A DIY beef jerky bouquet: When it comes to DIY birthday gifts, one filled with food is always a win for any guy in your life and this beef jerky version is so great! He’ll be thanking you with a full mouth all day. Leather Laptop Case: Wrap up his tech gear in style. A leather laptop case with tiny metallic studs makes for a protective but stylish way to keep his computer safe. Hand-Stiched Felt Fox Coffee Sleeve: Warm his heart and his mug with this adorable coffee sleeve. I picked these DIYs for their creativity + versatility. They can really be gifted to anyone with an upcoming birthday! Think family, friends, neighbors, coworkers, teachers, coaches..yep, just about anyone. I plan to whip up a few of these DIY birthday gifts to have ready for when I need a last-minute birthday gift to give. 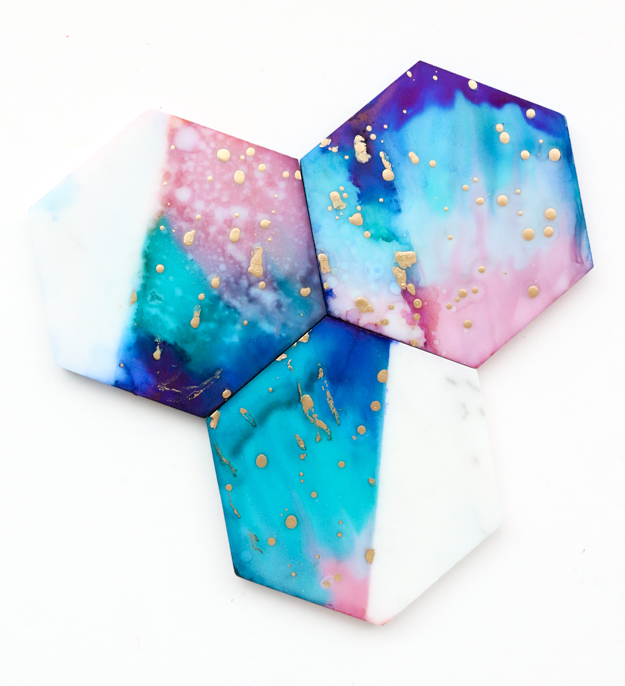 Galaxy Color Blocked Marble Coasters: I’m digging this galaxy thing lately and these coasters are a functional way to display the trend. Arm Knitted Wreath: Wreaths have a special place in my heart. They just make the front door so happy and provide a warm welcome to all our guests! This arm knitted wreath is easy to make and turns out so beautifully. Painted Camera Strap: For the photog in your life…a pretty piece that adds some custom flair to their favorite tool. 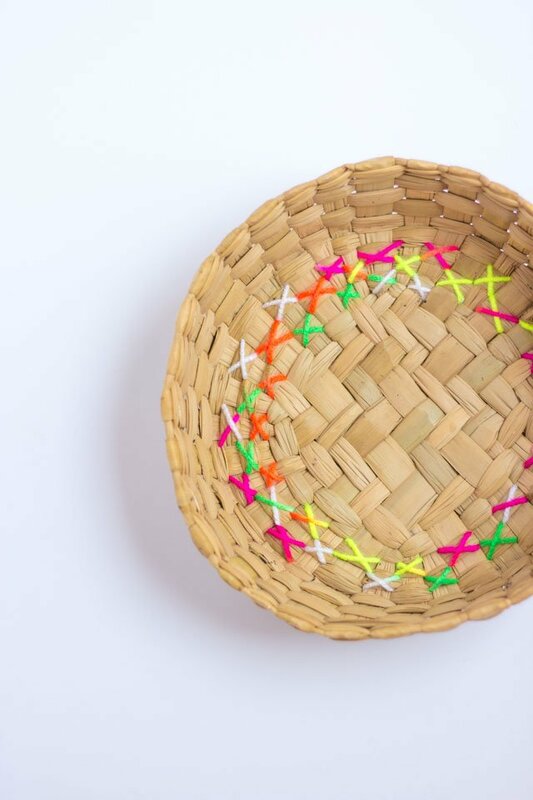 Yarn Embroidered Basket: The perfect place for storing all of the things–fruit, wallet & keys, even blankets. You can embroider a basket of any size and with any color yarn to make it work for any area of the home. DIY Stamped Tea Towels: Stamp a favorite quote, initials, or funny saying onto tea towels for a gift that’ll make someone smile. 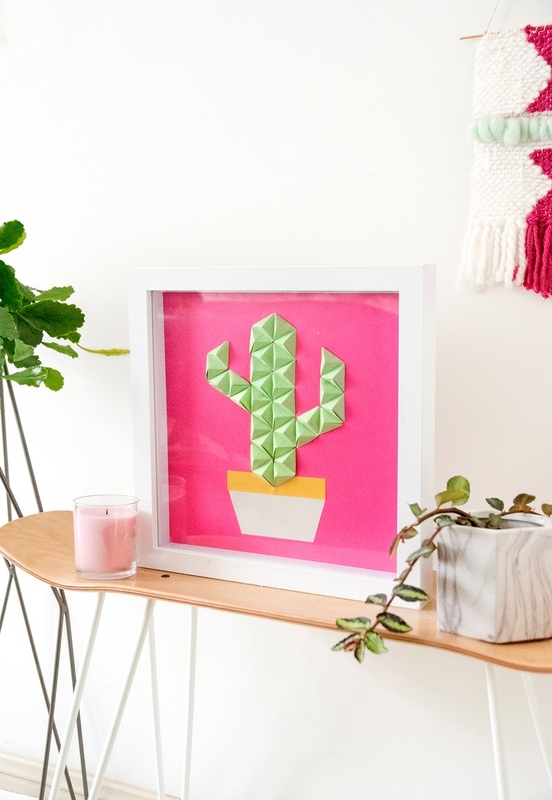 Origami Wall Art: This piece is so fun and the bright and friendly colors make it a piece that’ll work well in a bedroom, office, playroom, or entry. Infused Simple Syrups: Any cocktail connoisseurs out there? DIY simple syrups infused with a variety of yummy flavors make an awesome gift for a mixologist. Marbled Terra Cotta Pots: Gardening is a favorite hobby of lots of my friends. 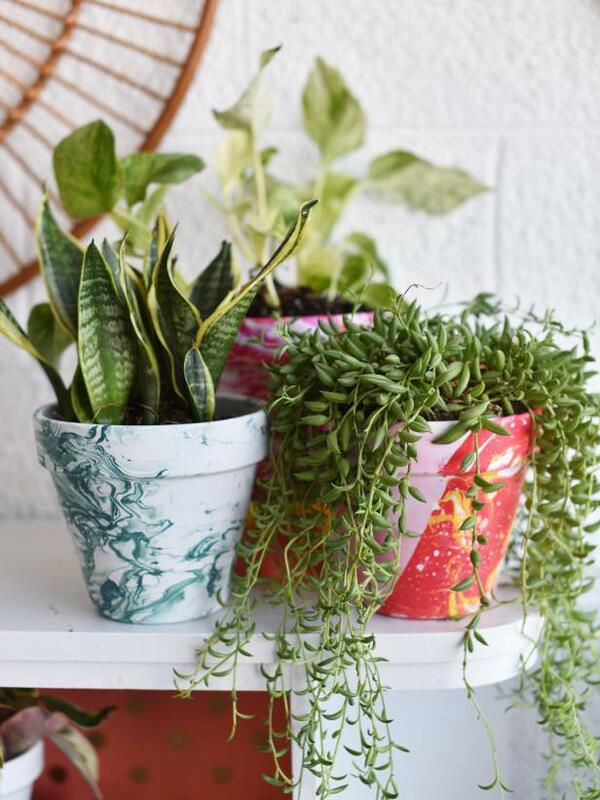 And even those who don’t have the greenest of thumbs will appreciate these beautiful marbled potted plants. DIY Wax Seal Stamps: Create a wax seal with a wine cork and a decorative button or tiny unique antique. Then, attach some colorful wax sticks to complete the gift. You could also include some blank cards and envelopes too! 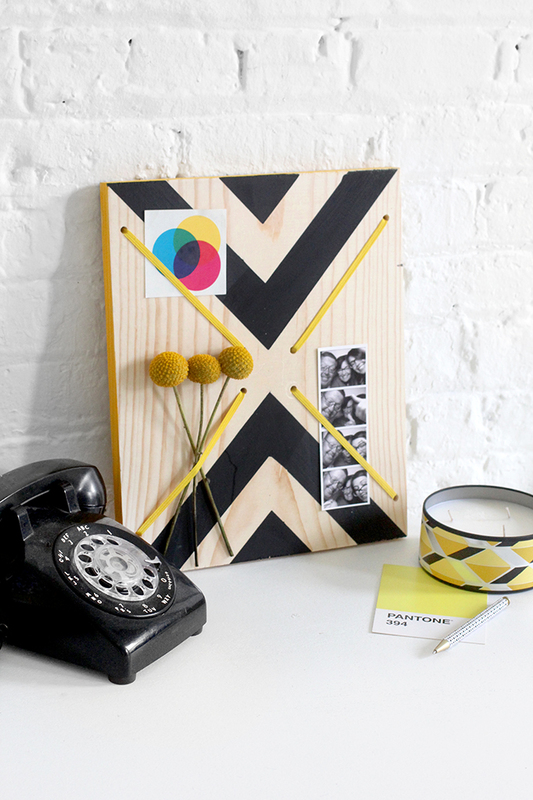 Graphic Print Memo Board: Great for displaying pictures, reminders, post-its, and mementos. Pick the birthday guy/gal’s favorite color as the accent for a one-of-a-kind board that they’ll especially love. Metallic Feather Pens: Kick it old school with feather pens! Add some metallic spray paint for some sparkle and shine. Fleece Blanket with Pom Poms: Everyone loves a cozy blanket and the pom poms on this one give it something extra special. 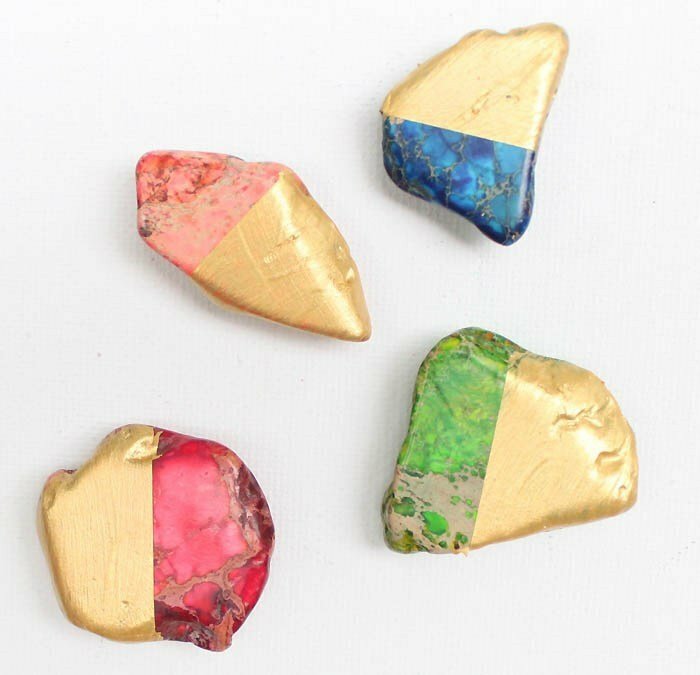 DIY Gold Dipped Magnets: For all of the treasures that find their home on the fridge! Copper Votive Candles: Candles are another gift that work for everyone on the list but these DIY votives take a classic gift to the next level. They’re beautifully bright! 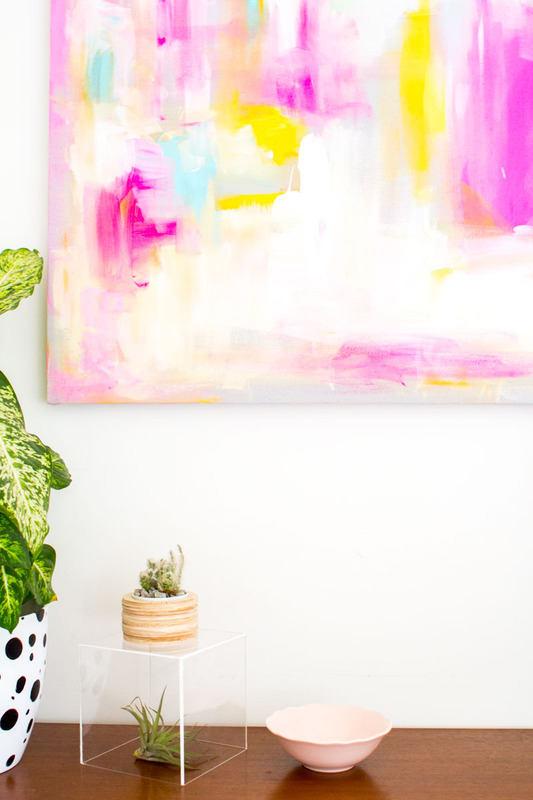 DIY Abstract Artwork: Even if you’re not the most artistic, this abstract DIY will walk you through the steps to create a picture that anyone would be proud to display. I think this makes a wonderful gift for someone who appreciate home decor, the birthday friend who just moved into a new house, or a family member who just got upgraded to a big, new white office space! Get creative; there is always a reason to add something pretty! I love that these DIY birthday gifts take the same amount of time to make as a trip to the store to pick something out and purchase it. And, they mean so much more because they’re made with love!